(formerly known as The Dunstan) – was named after the nearby Dunstan Mountains, and was the town at the centre of the Dunstan Goldfields rush of 1862. Today, Clyde is overshadowed by the Clyde Dam hydro-electricity scheme. 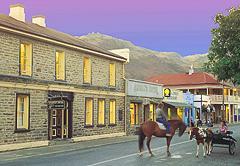 Stone and wooden buildings, dating back to the 1860s, line the streets of this historic town. Oliver’s Restaurant and Lodge, once a miners’ general store and stables, are steeped in old world charm. Dunstan House, opposite, was built in 1903 although the first hotel on this site dates back to 1862. Take a walk back through history to the museum at the former Courthouse and then along to the first herb factory established in New Zealand in the late 1930s.